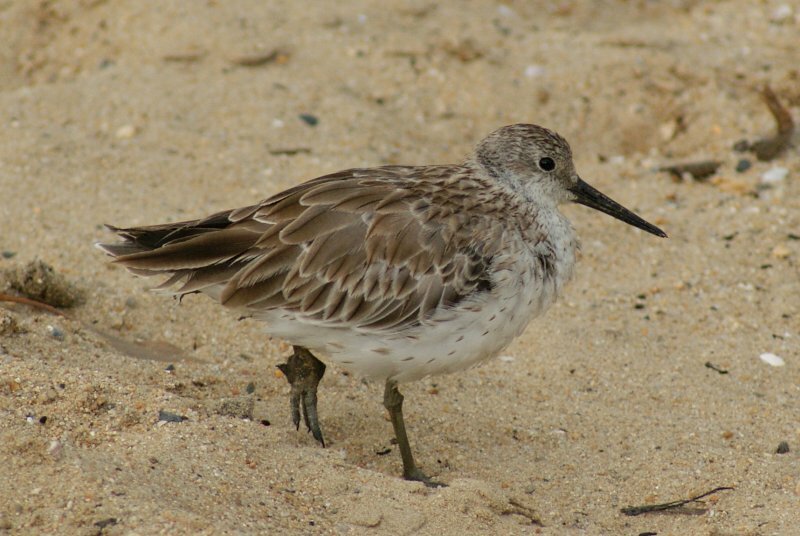 The Great Knot is a migratory wader that arrives in Australia from Siberia, where it breeds in the Northern summer. Some non-breeding birds will overwinter here and in other tropical regions. They are generally found on coastal mudflats and beaches. It is the largest of the calidris waders, which includes birds like the Sanderling and Dunlin. They are mostly pale brown-grey in non-breeding pluamage and superficially similar to the smaller Red Knot, which can be differentiated by the longer bill and size. In summer, they acquire dark spots on the breast, whereas the Red Knot becomes a rusty red on the breast, neck and face. They are 28-29 cm long. 1: Cairns Esplanade, Qld, 20/10/2010.